RRB ALP Stage 2 Answer Key 2019: Railway Recruitment Board (RRB) conducted the Assistant Loco Pilot stage 2 (CBT 2) written test on 21st, 22nd, and 23rd January 2019 respectively. Many of the hopefuls who have qualified in the stage 1 examination have competed for the Computer Based Test 2. The examination held in many places across India. RRB conducted the CBT 2 in regional Railway Recruitment Board associated places. Hopefuls who have competed for the CBT 2 can check the answer keys from the RRB regional websites. Candidates can also check RRB ALP CBT 2 answer key 2019 from the Indian Railways official website, indianrailways.gov.in. The answer key is the most useful document needed to compare and estimate the score. Aspirants can download RRB ALP CBT 2 OMR sheet, answer keys and can estimate the score by comparing the attempted answers with it. Candidates can get an idea about their attempt, the probable score, which is going to obtain in the examination and other details by downloading the answer keys. RRB has recently released the 26502 ALP/Non-Technical Grade III posts. A huge number of aspirants seeking for the Railway jobs have applied for the RRB Loco Pilot Technician Grade III vacancies. Totally Railway Recruitment Board (RRB) has nearly 21 boards which work with it for selection of eligible candidates into various RRB departments for various parts of India. RRB has recently conducted the 1st level examination for ALP and Technician posts. Lakhs of hopefuls seeking to get railway jobs have competed for the stage 1 examination. And also RRB has unveiled the result on 13th January. RRB conducted the CBT Stage II examination in the month of January. 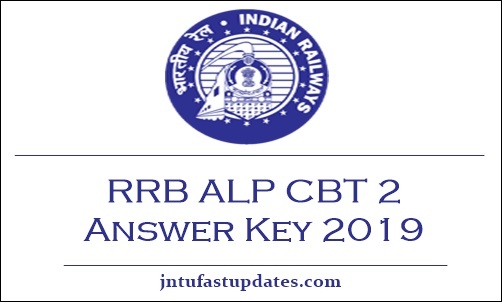 RRB is anticipated to release the RRB ALP CBT 2 answer key 2019 for January exams shortly on RRB regional websites or indianrailways.gov.in. Aspirants can download RRB ALP CBT 2 answer key/question paper solutions 2019 PDF for all sets A, B, C, D. and compare with the corresponding set attempted in the examination. As per the reports, the RRB is going to release the ALP CBT 2 answer sheet 2019 in the month of February 2019 [tentatively]. Candidates can raise the objections against the answer key in the month of February itself. Candidates who are keen to check the answer sheet soon can obtain the unofficial answer keys from various sources. Various coaching institutes will release RRB ALP CBT 2 unofficial answer key 2019 soon after completion of the examination. Hence the hopefuls can initially check the unofficial answer keys and later they can check the official answer keys after the RRB released. Candidates competed for the RRB ALP CBT can estimate the score by comparing with the answers. There will be a negative marking of 1/3 marks for each wrong answer. Candidates have to take this into consideration while evaluating the score. The final Merit List takes into account 70% of Part A CBT 2 marks and 30% of the RRB ALP Computer Based Aptitude Test marks for Loco Pilot. Search for RRB ALP CBT 2 answer key on the homepage. Click on the link and provide the necessary login credentials. After that, tap the submit button. The RRB ALP CBT 2 question paper solutions 2019 will be downloaded for all sets A, B, C, D.
Tally with the answer sheet with the corresponding set and estimate the score.